Develop a versatile fixture to launch and grow an entirely new category of pet products. Sergeant’s, a nationally recognized Pet care brand in major retail channels was introducing a new category of products for both dogs and cats. They needed a versatile, permanent display that was highly visible, educational and able to accommodate new packaging formats as the category grew. 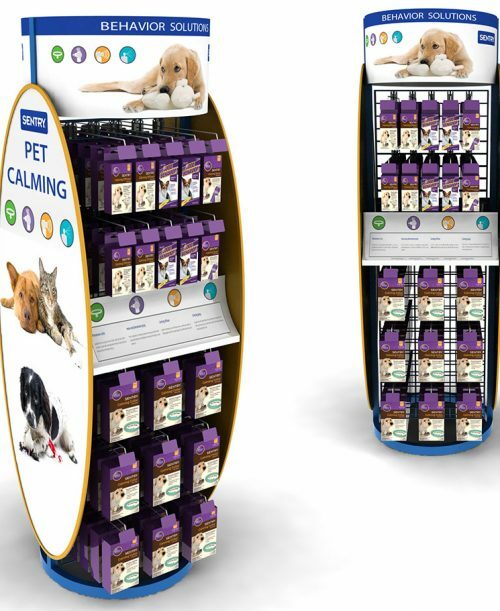 Sergeant’s, a nationally recognized Pet care brand in all the major retail channels was introducing a new category of products for both dogs and cats.They needed a versatile, permanent display that was highly visible, informative and able to accommodate new product packaging as the category grew. We delivered 360 degrees of engagement with a revolving fixture and extensive graphic areas for communication. The center slatwall style panel accommodates shelved or peg-hooked packages with adjustable spacing to hold a variety of formats and sizes. The center panel created two display areas to separate dog and cat products. The center console panel was ideal for product education and large graphic side panels and circular header drew attention from any viewing angle. The easily updatable graphic areas, the display’s adjustability for future product sizes and planograms, and it’s 4 sided merchandising visibility were key features the brand and retailer needed for growing a new category. This unit purrs with immersive engagement.